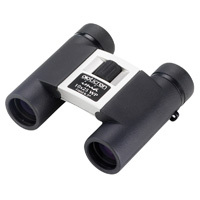 Introduced in 2003, the Imia roof prism compact binoculars offered high level optics at an affordable price, all packed in to a true pocket size body owing to its bi fold design. In December 2011 the Imias received an all round make over, with improvements to the body, mechanics and optics, as well as being made waterproof. As with most compacts, the Imias are available in both 8 and 10x magnifications. The Imia WP models are available in all black or black and gun metal and retail at £85 for the 8x25 and £89 for the 10x25. 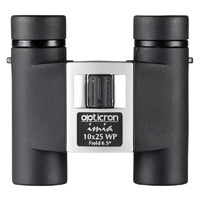 I always try to be honest and impartial when reviewing binoculars and am happy to pit Opticron binoculars against rival competitors. I'm also happy to compare Opticron against Opticron, so when testing the recently arrived Imia WPs, I thought I'd see how they stacked up against the less expensive Trailfinder T3 compacts. The 10x25 Imias offer a wide 6.5° (114m @ 1000m) field of view, significantly better than the (still useful) 5.5° on the T3 10x25s. In simple terms the wider the field of view the wider the picture you see (read our full description here) and the extra 1° produces an appreciably larger image. This made the Imias a very easy pair of pocket binoculars to use as I was able to 'track and trace' birds in flight comfortably and with fully coated optics the picture produced was clear and crisp, though with a slightly disappointing drop off in detail at the edges and a low level of chromatic aberration. Looking through both the Imia and the T3s, both models (being compact binoculars) didn't perform too strongly in dull conditions but when the sun finally came out they both offered a bright image, with nothing really to pick between the two. Close focus is specified as 2.5m on Opticron's website and I managed exactly that in testing, ample enough for general use though nothing quite like the 1m I managed with the T3s. For build quality and comfort I rated the Imia WPs very highly, the rubber armouring offering plenty of grip and protection. All elements of the body felt robust and performed well: the dioptre adjustment offered good resistance yet still turned smoothly; the twist out eye cups turned well and provide adequate levels of eyerelief and finally the wide wheel focussing was fluid, though not as quick as some of Opticrons other binoculars, taking just under 3 rull rotations from close focus to infinity (compared to just over 1 and a half on the T3 compacts). This isn't necessarily a negative and can in fact be a positive, as making fine adjustments is actually easier than others. Owing to their double hinge (bi fold) design, the Imias fold down to just under 70mm wide, making them what I call a true pocket pair of binoculars. None-the-less they retain a decent IPD (Interpupillary distance) meaning they'll fit comfortably to most eyes. The Imia WP models are supplied with a pair of end caps (which fit either the objective lens or act as a rainguard), a simple fabric lanyard, a nice soft protective case and a cleaning cloth. As expected, the guarantee is for 5 years providing some peace of mind. With most pocket binoculars used as a secondary pair or for general light use, the level and quality of accessories supplied is more than adequate, so lets now look at the total scores! Testing the Imias side by side with the Trailfinder T3 compacts was certainly an interesting comparison - the Imias snatched it for me though thanks to their bi-fold design and wider field of view. Ultimately, I had to give the Imias one mark less for optical quality than the T3s, based on their slightly worse edge softness and poorer close focus, even though the field of view is that bit better. The Imias are a fantastic pocket pair of bins, none-the-less, and where style is concerned, not much else comes close.